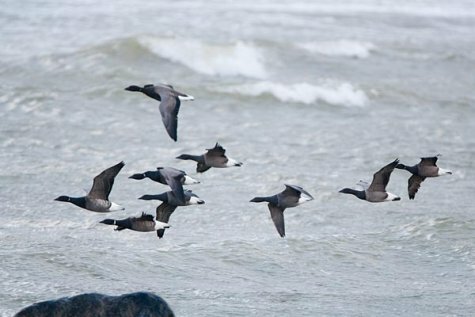 Brant geese migrate in small numbers; the movements and looks of these geese are quite different from their relatives. They certainly catch your eye. On migrating they fly even long distances at low altitudes above the water and in irregular groups – not in the traditional migration triangles of other geese. Brant geese seem like "black“ birds at sea: goose-sized, plumage brownish-grey or darkly spotted, only the tip of the tail is white. The belly can be light or dark - it depends on the subspecies. The sides of adult birds’ necks are garnished with white patches, young birds lack the neck patches. In Arne’s photo the young and the adult birds show very well. 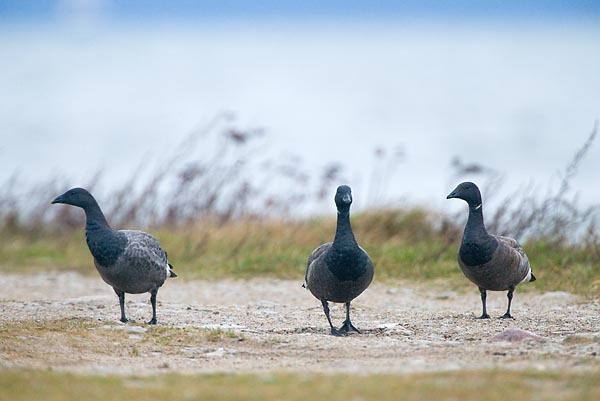 Brant geese have "learnt“ to use the shore pastures only during the last decades - it is likely that other geese have been "role models". Earlier the species fed nearly exclusively by foraging in the low water in the bays of the coastal sea, as swans do. Very good swimmers, can also dive, but even when disturbed prefer to swim quickly to leave.